Circle is one of those amazing, gorgeous picture books that I love and adore...right up until the very last page. But that last page does my head in every single time I read it. Before I go into the final page, let me tell you all the reasons why I love and adore the rest of the book. Firstly, I had the very great privilege of attending the book launch and exhibition opening for Circle at the Australian Maritime Museum in Sydney last year. Being able to see Baker's collages up close and personal is a real treat that I would move heaven and earth to be a part of (I also attended the opening of her exhibition for Mirror six years ago). The collages were hung between child and adult height for everyone to enjoy. They're not huge pieces, which makes the precision details in each one even more impressive. The colours, the textures, the perspectives are an aesthetic delight. 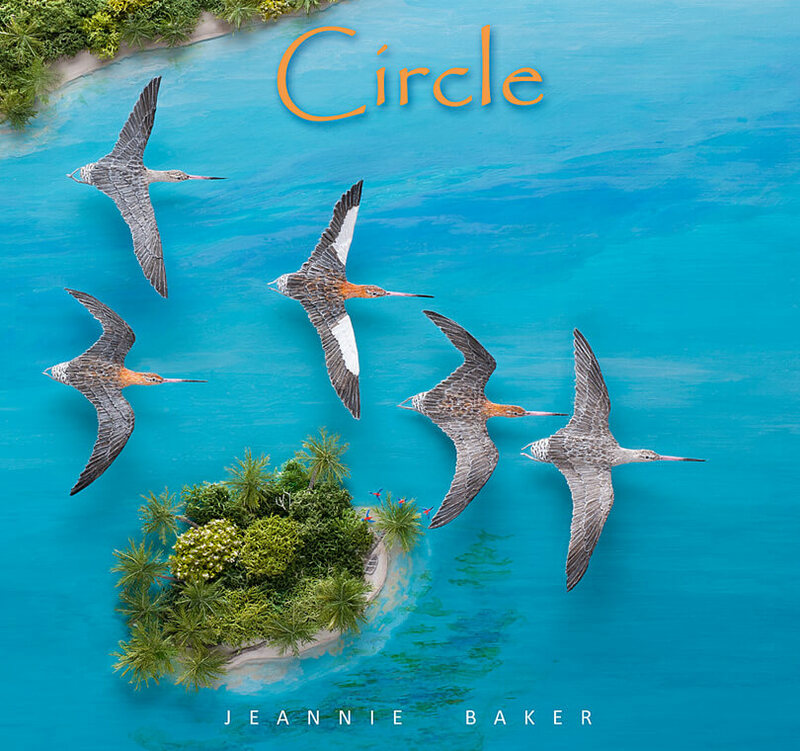 Secondly, Circle is the story of the bar-tailed godwit, a migratory bird that I knew nothing about until the launch/opening night. This incredible little bird takes a six day flight from Australia/New Zealand via the Yellow Sea to Alaska each year. Thirdly, this is a story about our environment and our climate and what we have been doing to it and how it affects the smallest members of our planet. It's a story about our global ecosystem and how everything is connected. 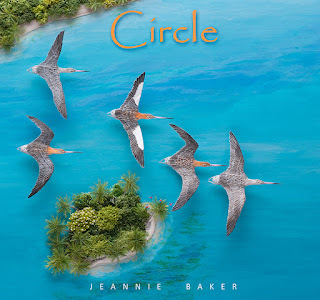 Circle is the ultimate tale of belonging. The very first illustration in the book shows us a boy in bed with a wheelchair beside him. We have no explanation for this. The assumption I made was that the boy had a permanent disability. There was nothing in the image to suggest to me that he was only injured for a period of time (i.e. wearing a cast for a broken leg, get well cards on the bedside table etc). Instead he is reading a book about birds and day dreaming about flying. Baker refers to an injury in the teacher's notes provided on the night. If this had been obvious to me, I could have accepted this very same boy at the end of the book on crutches, rushing to save the godwit on the beach, dropping his crutches and suddenly walking/running. If I'd known he was recovering from a protracted injury, I could have applauded his hard work and apparent recovery. The teacher's note conclude with 'thus, the bird's year long migration is given a human perspective'. However it looked to me, like a child with a permanent disability who suddenly walked. It didn't make sense. I certainly didn't experience the human journey within the bird's journey that the notes indicated. It felt like it was something added on as an afterthought. Part of judging whether a picture book for children has been successful or not is if the illustrations and the stories work alongside each other. According to the CBCA judging criteria for early childhood books, there needs to be a 'unity of purpose' where the issues in the text and the pictures revolve and resolve together. Perhaps this is why Circle has been longlisted for the Picture Book of the Year award (which focuses on the illustrations) and the Eve Pownall Book of the Year (which focus on the information/non-fiction elements within the story) and not the Early Childhood Book Award. + Winner of the 2017 Australian Indie Book Children's Award. I'm having trouble commenting on your posts via www.nancyelin.wordpress.com The comment Drew.blog is probably a 'test'done by Wordpress support. My comments on your site can only be published via Google profile. BTW lovely foto's and thoughts on this post! I've now done some research on why my comments don't allow the name/URL option like some other blogger blogs do. It's to do with the comment moderation I've chosen to use. I don't allow anonymous comments anymore as I was getting too much spam...and the name/URL option basically allows anonymous spammers to spam their little hearts out. So yes, I'm sorry, but you will have to use your google profile to comment on here, just like I have to switch from my google acccount to my wordpress one to comment on wordpress blogs. I believe open ID allows commenting on both blog types...but that is yet another account to manage! And I haven't gone there. How did you comment on here with your old blog? I've had the anonymous commenting turned off for quite some time now, so perhaps there is something different in the settings in your new blog? I had a mini-fit a few years ago with all this, but then I read another blogger talking about the realities of on-line life and multiple accounts and how to make it work better, She/he suggested consistency - so I spent an hour or so changing my avatars on google, wordpress, disqus, instagram, my fb page and twitter so they were all the same. I tried to use the same name/handle on all the accounts too, but some didn't allow changes. I just used the wordpress profile during the last 5 years but something has changed. Perhaps Wordpress has had an update that left my old account untouched. Well, I'll just keep using the Google option. I know how much time it takes to keep the blog working as you like. It took me 2 days to set up a new blog! I was exhausted. It's time to gather my thoughts for Brona's Salon post! I love the collages. I want to see them in person!